THE SMOKERS’ GROUP Forest Eireann has criticised the picture health warnings that will be mandatory on all tobacco products sold in Ireland from the start of February. Spokesman John Mallon said today that the group supported measures that educate people about the health risks related to smoking but these images are “designed not to educate but to shock and coerce consumers to give up a legal product”. “What next, graphic health warnings on alcohol, fatty foods and cars?” he added. Research in other countries has shown that health warnings, combined with coloured photographs, may discourage people from smoking and make them aware of the health risks involved. Poll: Do you think strict rules on cigarette packaging will make any difference? Email “Smokers' group slams introduction of graphic health warnings”. 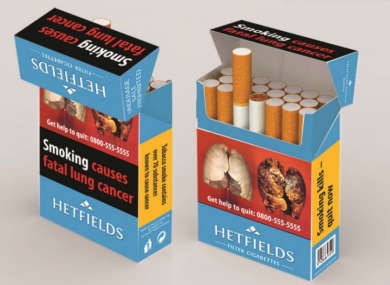 Feedback on “Smokers' group slams introduction of graphic health warnings”.